Dentures are not the end all be all of full teeth replacement. Even if every tooth is missing, dental implants can transform your dentures into a reliable prosthetic that provides a normal bite and a full smile. Clear Fork Healthy Dental Care offers implant placement and restoration with dentures that suit your needs. Our Forth Worth dentists, Dr. Cole and Dr. Shelby, understand how to make dentures function as natural teeth do, restoring our patients’ ability to pursue daily life with confidence. To obtain excellent dental implant care with denture solutions in West Fort Worth, contact our dental practice for a personalized consultation, today! Dentures, even if they are top-of-the-line, are still prone to slipping or losing their tight fit over time. Our practice offers dentures affixed to implants as a solution to this unreliability, replacing the need for adhesives or dentures that are secured by suction. Implant posts are placed into the jaw bone and anchor a range of denture prosthetics. Along with being a permanent remedy for tooth loss, this advanced treatment offers oral health and functional benefits. Dentures have a stable foundation that supports a normal bite and a natural aesthetic. 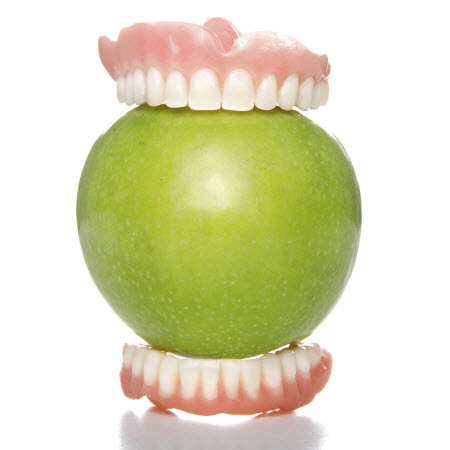 These dentures are not bulky and do not cover the palate, ensuring a more seamless appearance. Our practice offers this procedure to help those who are missing most or all of their teeth. Dentures supported or retained by implants are the best option for establishing a smile that’s almost as pleasing as normal, inspiring both self-esteem and improving daily comfort. We offer quality denture options that suit your needs, whether you prefer to remove dentures each night, or are more interested in permanent prosthetic. Dr. Cole places implants where jaw bone is strongest and allows for resilient dental implants support. If patients do not have a sufficient amount of bone, we can use mini-implants to support snap-on dentures. These balance the convenience of traditional appliances with the full stability of implant posts. Our implant-retained dentures are permanent and can only be removed by a dental professional. These rely on more extensive implant placement but are a sure way to have a restored smile that looks and feels just like natural teeth. We can also apply this method to partial dentures or bridges, which look seamless next to existing teeth. Our holistic dental practice uses top-notch materials and biocompatible treatments that fulfill your oral health needs and protect your overall wellbeing. We offer teeth replacement with biocompatible dental implant prosthetics to rebuild dental function and ensure a beautiful smile for a lifetime. Call us today for a consultation!